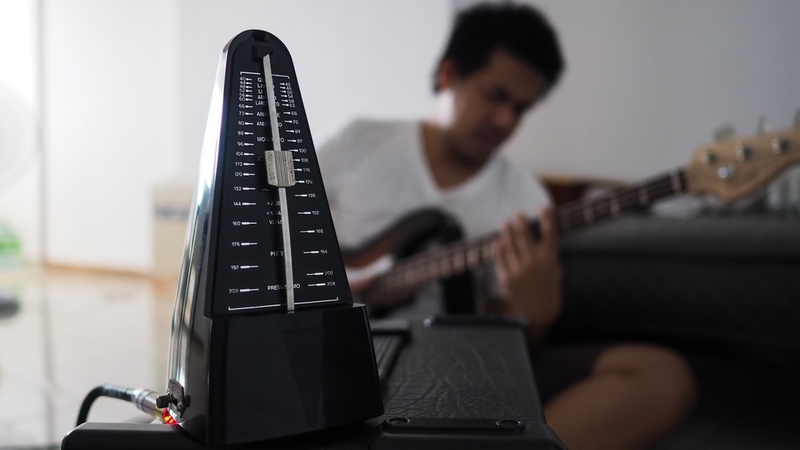 By practicing with a metronome, you can hone your rhythm and timing. But who actually carries around a metronome everywhere? This isn't the 1974 anymore. Technology is here to help. There are many metronome apps out there on the market, but picking the right one can be a little difficult. To save you the trouble of wading through the endless sea of apps and wasting your valuable time, here's a streamlined list of the top five metronome apps on the market. 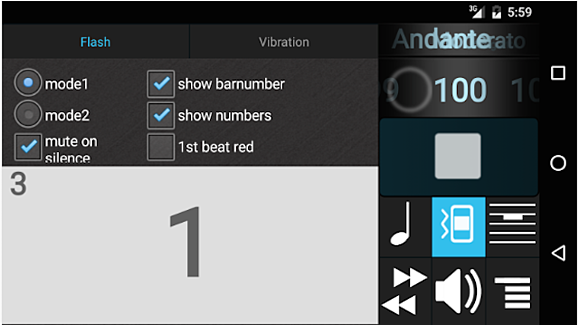 Metronome+ is smooth, simple, classy, and above all, easy to use. As any good metronome should be, this one is accurate and loud. Included is a tap feature that gauges tempo and allows you to customize meters. It's also a handy multitasker, meaning you can read sheet music on your iPhone or iPad while still keeping the metronome going in the background. For those who are unfamiliar with metronomes, Metronome+ is perfect due to its user-friendly interface. It works and looks great, so you can't really ask for more. 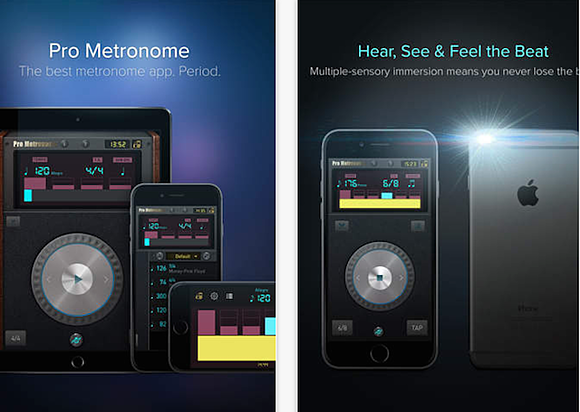 For a free metronome app, Pro Metronome doesn't slack. Thirteen unique metronome tones are included. Pro Metronome runs with advanced, real-time playback technology, meaning it's one of the most accurate metronomes out there. For those who want customization, this app has it. Change accents, beat tones, and dynamics of your rhythms. If you want to splurge, the Pro version has more great features like subdivisions and polyrhythm settings. This allows you to create more complex patterns with dotted notes, triplets, and non-standard time. It's also great for beginners, as it has a rhythm trainer on board that teaches you how to keep time. Don't worry, Android users, you're not forgotten. Metronomerous is both free of charge and free of advertising, leaving you to explore the complexities of time uninterrupted. Like subdivisions? Metronomerous has them! There are eighths, sixteenths, triplets, quintuplets, and septuplets. Put accents on any sixteenth or triplet note. If you want to set different volumes for each subdivision or accent, this app makes it possible. Another cool feature about Metronomerous is the way you set the tempo. It has a slick slide feature, tap feature, or old-fashioned numeric input. For the Italian purists out there, this app uses only the Italian tempo names (as it should) and gives you beautiful, visual, and vibrating tempo feedback. If you like what you see, it's possible to save your different settings and store them in the app's BeatList for later use. With this app, Android users get a bit of a price break, but they're barred from downloading Tempo Advance, which is iOS only. We're talking about Tempo regular here, though. Just like the other apps, Tempo has the usual features included. There's a variety of time signatures and meters, and you can save their custom rhythm presets. Furthermore, the app has multitasking capabilities, meaning you can keep it going the background while your device is locked or running some other app. The advanced version does have some nice customization options, though. For example, you can control the volume of the app separately from the phone's volume. It may seem like a minor feature, but you'd be surprised how much that comes in handy. 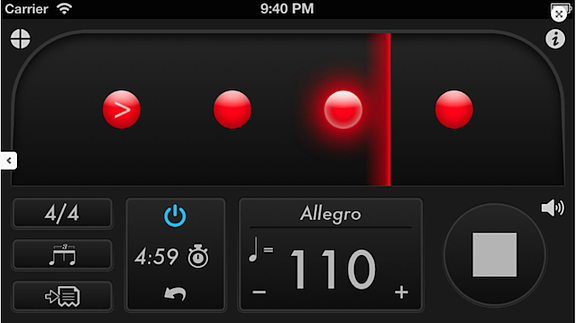 Tempo is a basic, no-frills metronome app, but don't overlook it just because it may lack bells and whistles. Yet another great app for Android users. 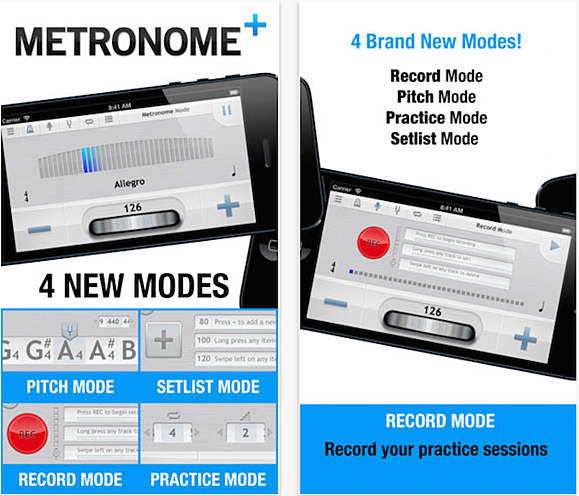 This free and interactive metronome app doubles as a speed trainer and was designed by musicians. 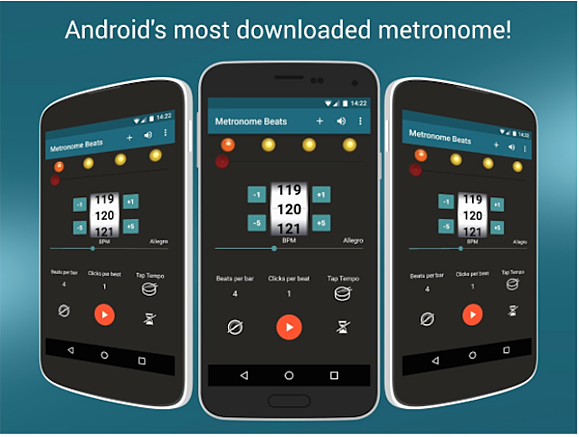 Metronome Beats claims it's the world's most downloaded metronome app for Android with over five million downloads. The app was designed to be user friendly and has accurate control for increasing or decreasing tempo in small increments with one touch. The visual beat indicators tell you if you're on or off time and let you mute the metronome while still looking at the visual tempo. As far as customization, this app lets you create custom sound settings or even change the pitch so you can hear it easily over other instruments. A unique function is the timer. This allows you to stop Metronome Beats when and where you want. Furthermore, depending on what device you have, the app's interface will change, giving you a varied experience each time.